The calendar tells me the first day of Spring is this week. The weatherman tells me otherwise. Nevermind another snowstorm, I'm forging ahead with plans of spring. There is something I've wanted to treat myself to for ages - a graphic striped garden umbrella for the backyard - but it feels so wasteful. I have a perfectly functional garden umbrella that despite my best efforts of leaving it out for the past few winters is still looking just dandy. This is the very definition of a first world problem. Anyone with me? This example from Decor Aid is summer perfection. And of course now that I'm trying to not be such a consumerist schlub, I see them everywhere I go. Dare I say I'm smitten with striped umbrellas? Ok yes, I'm smitten. 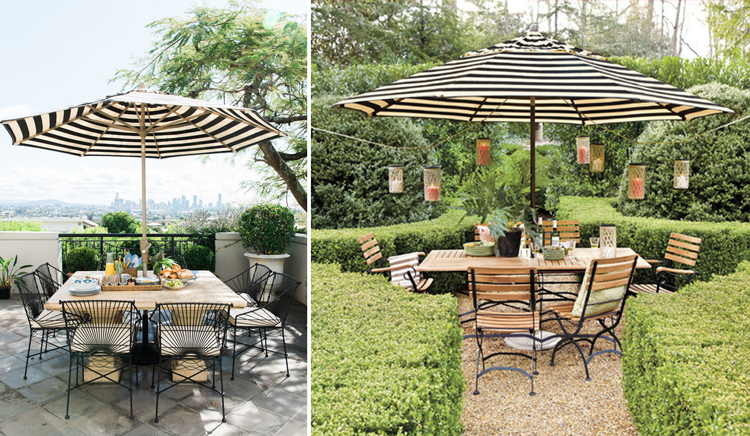 Of course some of my favorite bloggers have a black striped umbrella already in their backyards so I probably was not so subtly influenced by their styles. Case in point, Chris Loves Julia's deck is just amazing like everything else they do (that outdoor fireplace is giving me serious backyard envy). And the graphic punch looks just as lovely in more humble settings like this little corner shady spot from Blissful Bee (check out the entire backyard and you'll see the rest of it is not so humble!) and this great dining space by Rambling Renovators. Or maybe we need some international influence? From Australia, Porchlight Interiors knocked it out of the park on the left with Ballard Designs recreating an english garden on the right. I don't know if I can go another summer without one! I have my eye on this one which is reasonably priced but lacks any reviews. Anyone have this model and want to vouch for it's sturdyness? 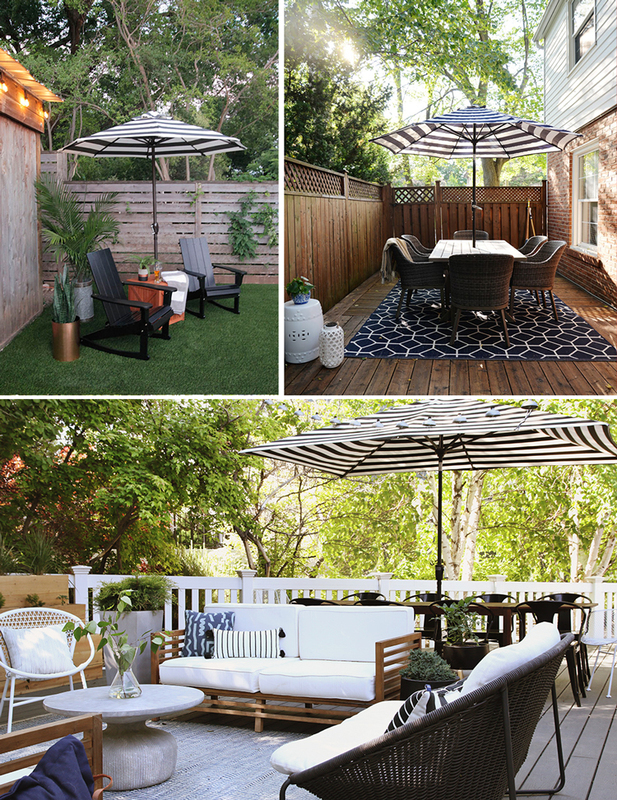 have you owned a patio umbrella previously? The three important things (to me) are: (1) an umbrella with a joint so the shade can be angled (2) mechanics that easily push the umbrella open (I once owned a shade that required me to insert a plug into a hole to hold it in place -- UGH!) and (3) a nice wide shade that will cover the table and guests sitting around the table (no less than 8 feet in diameter). This particular shade you posted doesn't have an elbow so it should aways be in static position. Yes I have them. My backyard is very small and is already shaded on south and north exposures so I thankfully only have to worry about shade when the sun is highest in the sky. I don't need the tilt function so I'm okay without it. The one thing I do need is something really sturdy b/c I leave it out all winter long (closed of course but still) so it can't be something that breaks easily. We have this one! We bought it and a pole at World Market in June and it’s survived 5 months of Kansas summer and fall in full exposure (super hot and super windy). We brought it inside for the winter, but I’m excited to put it out again in a few weeks. It’s reflection off our sunglasses has made for some great pictures! I might be biased but I say go for it! I love seeing ours when we’re dining beneath it but also when I spot it from other parts of the backyard. Outdoor furniture can be pretty neutral so a striped umbrella adds a nice shot of colour and pattern. Exactly - everything we have is pretty neutral so I think this will be a great graphic pop! Thanks for the inspiration Jen. I have one from Home Decorators (Home Depot) which has held up great for 2 Northeast summers! I do store it in the winter months. Love this black and white striped look! IKEA also has affordable b&w pillow covers to match! Thanks so much. Ikea sells outdoor pillow covers? How did I not know this? Thanks for the heads up. Do you mind sharing which one you have from Home Depot, I can't seem to find it in a search.